We always say we are going to save seeds. We know it will save us money. We know the plants grow well with our soil. We know the saved seeds will be unique. They’ve adapted to our growing conditions and there will never be another seed quite like it. Yet each year, time gets away from us. By the time we remember that we planned to save seeds…it’s too late. Or at least, we think it is. But this year, we actually did save seeds. 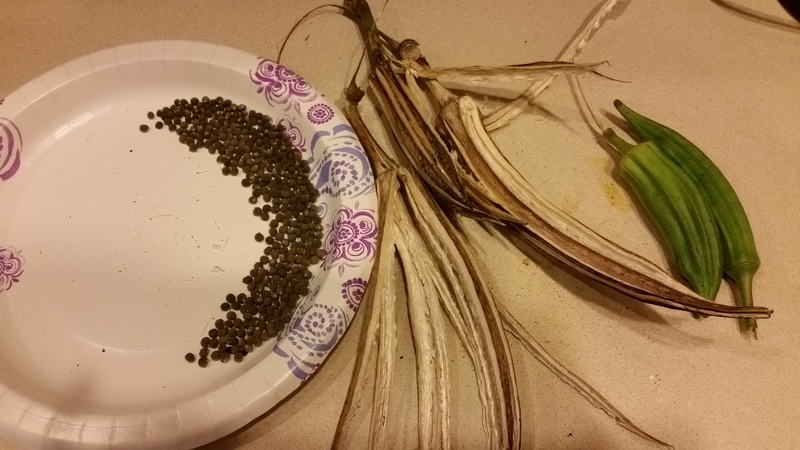 Okra seeds, along with pea and bean seeds are some of the easiest seeds to save. First, just let the pods dry on the plant. When they turn brown and start to split at the ridges, cut them off, open them up and shake the seeds out. Let them dry for a few days and, voila! They are ready to store. 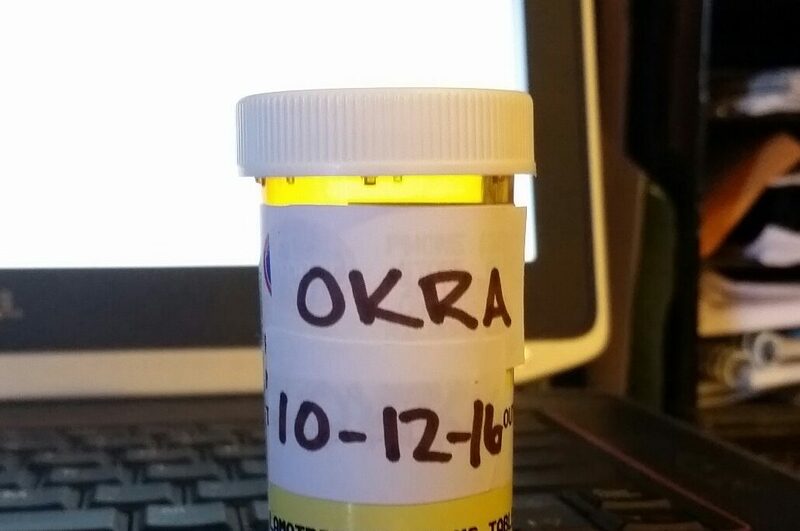 So far, we’ve saved seeds from three large pods and filled a small medicine bottle. 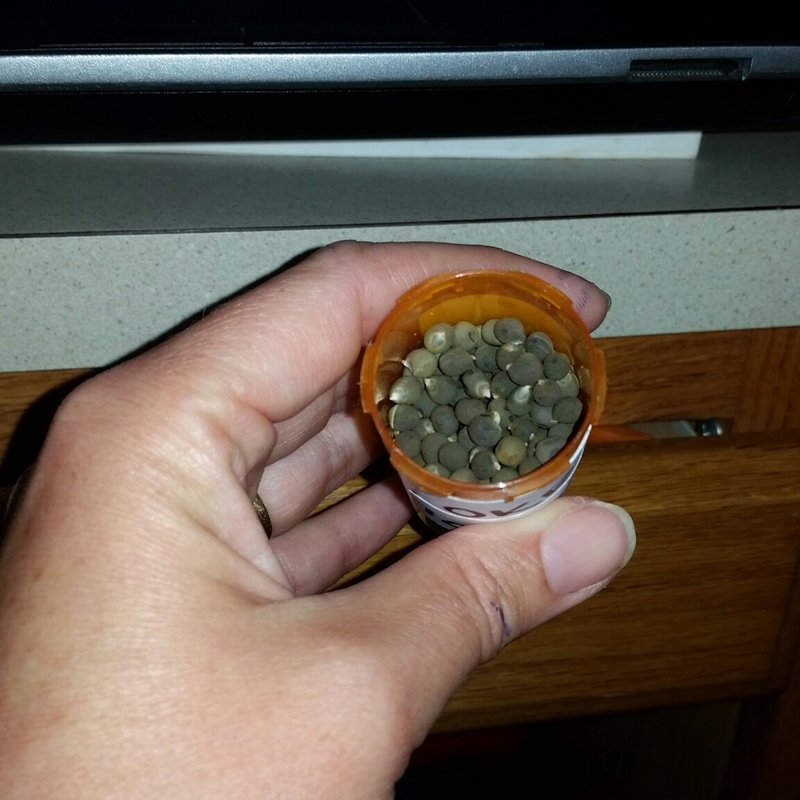 Old prescription bottles are one of the best containers for seed saving. They are easy to label and easy to store in neat little rows. Sunflowers are also good candidates for saving, although there are a few more steps involved. Tomato seeds are a bit easier than sunflower seeds, and pepper seeds even easier…at least there are fewer steps involved. Since we ate the three peppers that actually made it this year (slight exaggeration), and our tomatoes were devoured by the chickens, the okra seeds…and maybe marigolds…are the only ones we’ll save this year. At least it’s a start! What seeds do you save? This entry was posted in 13 Skills, Food, Garden Stories, Haiku, Writing. Bookmark the permalink.